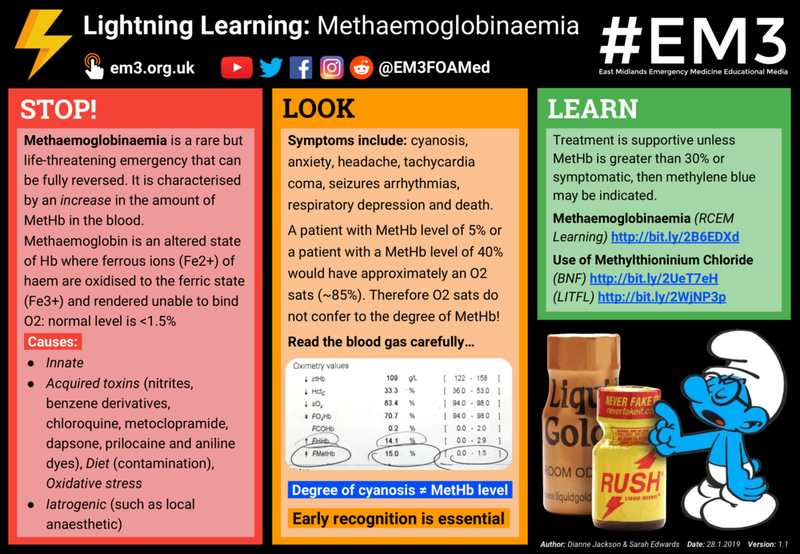 Methaemoglobin is an altered state of Hb where ferrous ions (Fe2+) of haem are oxidised to the ferric state (Fe3+) and rendered unable to bind O2: normal level is < 1.5%. Symptoms include: cyanosis, anxiety, headache, tachycardia developing to coma, seizures arrhythmias, respiratory depression and death. A patient with MetHb level of 5% or a patient with a MetHb level of 40% would have approximately an O2 sats (~85%). Therefore O2 sats do not confer to the degree of MetHb! Degree of cyanosis ≠ MetHb level. Early recognition is essential! Treatment is supportive unless MetHb is greater than 30% or symptomatic, then methylene blue may be indicated.